When the compressor fails and your central ac unit starts blowing warm air, you really need to decide whether it makes more sense to have the air conditioner compressor repaired, or replace the ac unit altogether. Depending on who you talk to, most repairman agree that if the central ac unit is more than 10 years old and out of warranty, it may make more sense to replace the air conditioner and coil, than to replace the compressor and just wait for other parts to fail. In this Charlotte HVAC Guide, we’ll explore what happens when you need to replace the compressor in your central air conditioner, or heat pump condensing unit. Along the way we’ll explain the parts and supplies most commonly needed to replace the compressor, as well as the wholesale cost of the parts and the price many companies charge for compressor replacement. 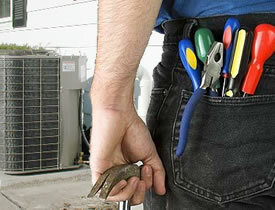 Many heating and air contractors charge a fee to come to your home and diagnose the problem with your home hvac system. You can get free repair estimates from our partners in Charlotte and most other major US cities. As you can see, even though some of the parts like the line filter or contactor are not directly related to the ac compressor, however, they are still replaced most of the time to assure no problems after the contractor leaves your home. It’s a much smaller price to pay at the time of the repair than having to call them back out 2 days later when it doesn’t start properly. In most cases, if your central ac unit is more than 10 years old and out of the factory warranty, it’s going to mean a few very important things. The refrigerant is likely to be R22, which is more expensive, and you’ll need several pounds to recharge the unit. Replacing the compressor only is going to expose other weak links, requiring further repairs in the near future. Make sure you have the entire system checked at the same time. You would hate to swap the compressor only to find evaporator coil replacement, is needed within 2 weeks. Central air conditioner compressor replacement cost is one of the most expensive repairs you can have done on your home HVAC system. It pays to get multiple replacement quotes at the same time and weigh all your options before you simply repair the unit. How much did it cost to replace your compressor the last time it was replaced? Share the price range below, it may help our customers understand whether to replace theirs or not.